For the first time in more than 40 years the PC leader's dinner did not feature a sitting premier. Follow along as CBC reporters tweeted the speeches and room atmosphere. 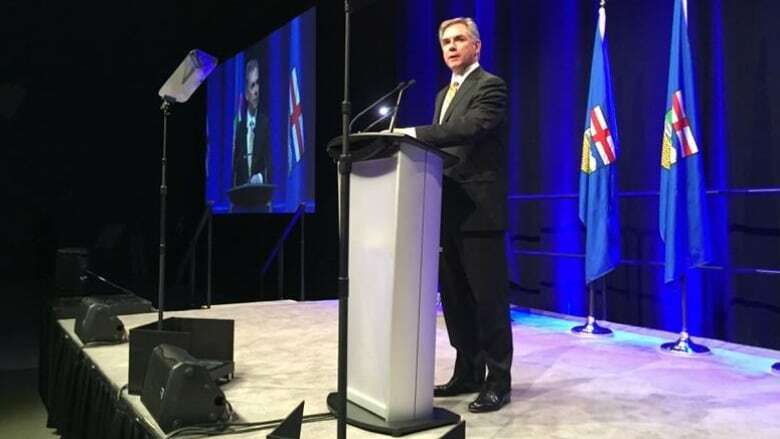 The Progressive Conservative Party's annual leader's dinner was held in Calgary tonight, and it's the first time Jim Prentice has spoken publicly since the party's election loss last week. He told supporters that he accepts full responsibility for the election loss, and that he let down PC members as their leader. Prentice defended his decision to call an early election, and his decision to step down as leader and MLA so he would not be a distraction. "We have been humbled by the decisiveness of the choice voters made," he told the gathered crowd. His speech was followed by an address from interim leader Ric McIver. McIver says the PCs are in the "penalty box" for getting things wrong, for being arrogant and for forgetting how to apologize. But McIver says the party remains strong, with the most experienced caucus and a leadership race coming which will help it pave the path forward. Mciver says that process will start by being a strong opposition to Alberta's new NDP government. Last year's event, hosted by Prentice as he ran to be the party's new leader, attracted a record 1,800 people. The PC party says tonight's event, a $500-a-plate sit-down dinner that was replaced by a stand-up reception, sold 1,550 tickets. Follow our live blog as CBC reporters tweeted the speeches and atmosphere of the room.